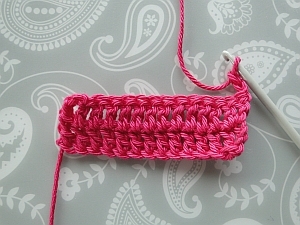 Learn how to crochet bullion stitch with my step by step tutorial and videos! You can try working bullions into a chain - but it's nice to have a good, solid base to work into if you're just starting out on this journey! 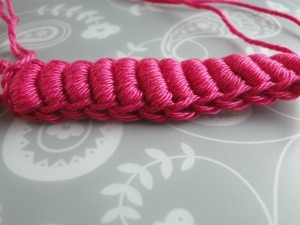 I'm using sports-weight cotton and my favorite 3 mm hook for this tutorial. Ch 16, dc (UK tr) into 4th ch from hook, dc (UK tr) into each ch along. Ch 3, turn. Miss first st, dc (UK tr) into each st along. Two rows of stitches made for the base, right side now facing us. 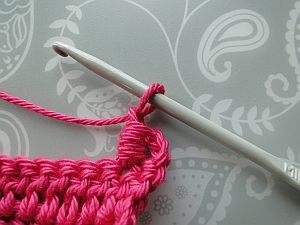 Step 1: Wrap yarn around hook 5 times. I hold each wrap with my right index finger to keep it on the hook as I go. Keep your loops relaxed - not too loose or hanging off the hook. Not too tight, either! 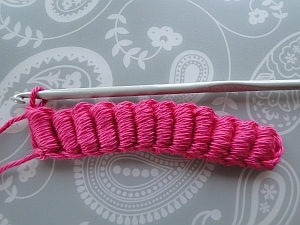 Step 2: Miss 1st stitch, insert hook into 2nd st, pull through a loop. Now is the time to tighten that loop under the hook - it's almost hiding under there! Tightening the very top loop you just pulled through so that it will go more easily under the other loops. Top tips for this crucial step! If you can pull your tightened loop under your hook comfortably under the first wrap, then you should be able to get it through the rest. If you need to loosen that first wrap a bit, "stroke" the wraps from back to front to work a bit more looseness into the first one. You can see how I do this in the video. If your wraps are too tight, undo and try again. I had to do this a lot when I started, and I still do from time to time. When making your wraps, inserting your hook into the next stitch, and pulling through your loop, keep your tension nice and relaxed. Only after you've pulled through your loop do you surprise your bullion and tighten the loop you pulled through under your hook. You shouldn't have to wiggle your hook around or twist it. Keep it pointing upwards. 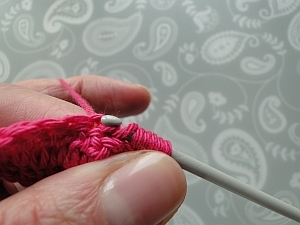 Hold the wrapped stitches between your thumb and index fingers. This keeps them together and under control. Things get a bit more difficult if you have a greater number of wraps, but if you can cope with 5 wraps, this is good training for what is to come. Play around with those wraps. Move them about a bit. See what happens if you move them one way or another. You'll soon have them behaving themselves! Step 4: Ch 1 to secure bullion. Repeat steps 1 - 4 along your piece to practise. The method above works with more wraps. Try 6 or 7 wraps and so on, and build up. If you're feeling really adventurous, move on to 12 wraps! Begin as above with a base for your work and chain 5 to turn. Why only ch 5? Well, although you'll have 12 wraps, you want them to be nice and close together to create a super-looking bullion! If you made 6 or 7 chain (as I tried doing) you end up having to pull the yarn up through the bullion at the end to get it to the correct height. And then your bullion looks rather stretched and out of shape... or at least, mine did! You may have noticed another method of crocheting bullions. 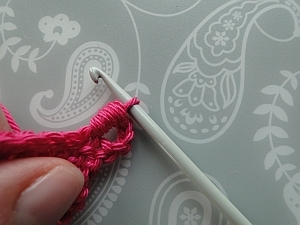 One of the most common I've seen is to wrap the yarn around the hook several times, insert your hook into the next stitch, pull through a loop, yarn around hook again, draw through all the loops, then ch 1. So this version involves an extra "yarn around hook." 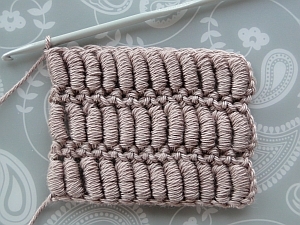 This also works well - it just depends on how you prefer to crochet the stitch. I found this stitch in Therese de Dillmont's Encyclopedia of Needlework, which is written for UK readers - so in US terminology, I guess this would be Bullion Double Stitch! In some editions of this book, Dillmont seems to refer to a bullion treble as being simply a stitch with 10 or 12 wraps. In my edition, she adds a further sentence, telling us to pull the yarn through all but one of the loops on the hook and then pulling a new loop through the last two loops on the hook. So this is the one I will explain here. Make a base for your stitches again as above, chaining 5 to turn - or do as I did, and work into any number of loosely worked chain, allowing 5 ch for the turn. *Wrap your yarn 12 times around the hook. 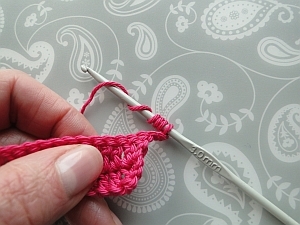 If working on a base: miss 1st st, insert hook into next st and pull through a loop. If working on a chain: insert hook into 6th ch from hook and pull through a loop. Then tighten the loop under your hook and pull it through all of the loops on your hook apart from the last one so that you are left with two loops on your hook. 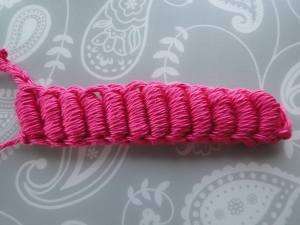 No need to make a chain stitch - just repeat from * to *. Very nice two-loop definition on the top of the treble bullion! If I was going to be working a second row, I'd rather work into the treble bullion on the right, wouldn't you? I guess the difference is explained by the fact that the regular bullions are finished off with 1 ch, and the treble bullions don't need that extra chain at the end. For the chain: I chained 12, working the chains even looser than I did before - because as you can see from the pix above, I didn't work loosely enough and my row of bullions curled a little. Then I chained 5 for the turn, working those chains with a tighter tension. Row 1: Treble bullion into 6th ch from hook, treble bullion into each chain along. 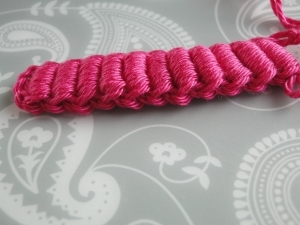 Row 2: Work 1 sc (UK dc) into the top two loops of 1st bullion and into each st along. Row 3: Treble bullion into 1st st and into each stitch along. Well - that was certainly an interesting experiment! I'm sure there are many more adventures to come with our bullions.